Hi all. I’ve just bought my first 911 and looking for help. My GTS doesn’t seem to have the halo/4 point daytime running lights. Instead it seems to only have the 2 strips in the bumper. I thought all GTS had DLR built into the PDLS headlights ie the white ring or 4 point led? Is that an extra upgrade? Hi and welcome to 911uk. My initial thought was that the DRL's of which you describe feature on the 991.2 and not the 991.1. I believe you only get this with the LED light option on the 991.1 but it’s a standard feature on the 991.2 xenons. Thanks. I suspect it may come with PDLS+ or maybe LED lights. Prob just not on standard PDLS. Think it would cost at least £2k to buy and retrofit. Anyone know of other aftermarket options? This was driving it home after collecting. Battling through the snow! Looking forward to when the weather improves to go on a proper drive. Currently tucked up in my garage! GTS with ducktail, and in Carmine. You look well north, snow poles in the background? Yes that was the A66 cutting across the Yorkshire dales. Yes I love the Carmine red and duck tail! ....... Yes I love the Carmine red and duck tail! Brilliant! great pic. 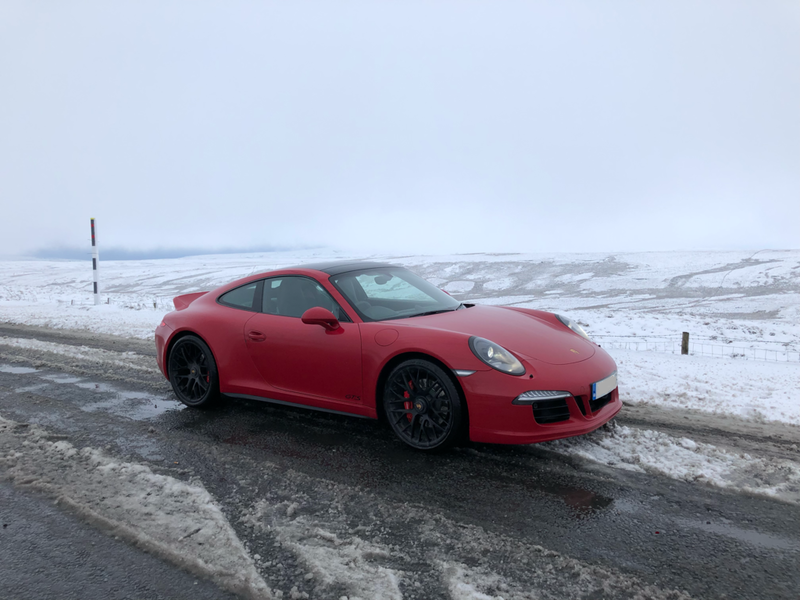 i've driven mine in rain and shine, snow and ice and always love the stability of the thing.